It seems that Emax is stepping up their game and jumped on the 23xx bandwagon. 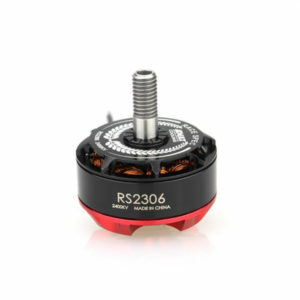 The RS2306 are the newest motors in their product line. They come in 2400KV and 2750KV and are designed for as stated by Emax. These are available for pre-order here for a $22-$23 price depending on the shipping. I haven’t yet met a pilot that hasn’t flown the redbottoms, whether that is the older ones 2300/2600 or the newer versions. As stated by Emax, the RS2306 are designed to set a new standard of power and response for pilots seeking the ultimate in flight performance. With nearly twice the level of thrust of the original Red Bottom, the new RS2306 sets the bar even higher by pushing 2kg of thrust with 5045×3 propeller on 5S or 6045×3 on 4S. The RS2306 are a continuation of the design that is used on the older RS2205-S.
1.8mm N48SH Arc magnets (thinner and lighter which allow lower mass on the outer portion of the bell, resulting in faster acceleration. Less energy lost and more power delivered to the propeller). BEEFY 4mm Hardened and Tempered Hollow Steel Shaft: Breaking shafts are a thing of the past. High quality 4mm Inner diameter Steel Ball Bearings.